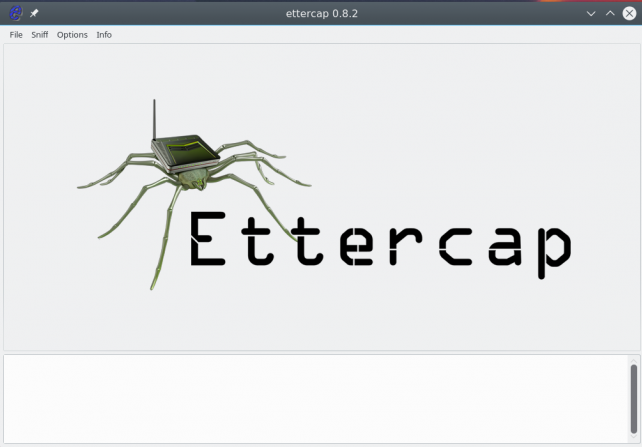 Ettercap is a utility for analyzing network traffic passing through a computer interface, but with additional functionality. 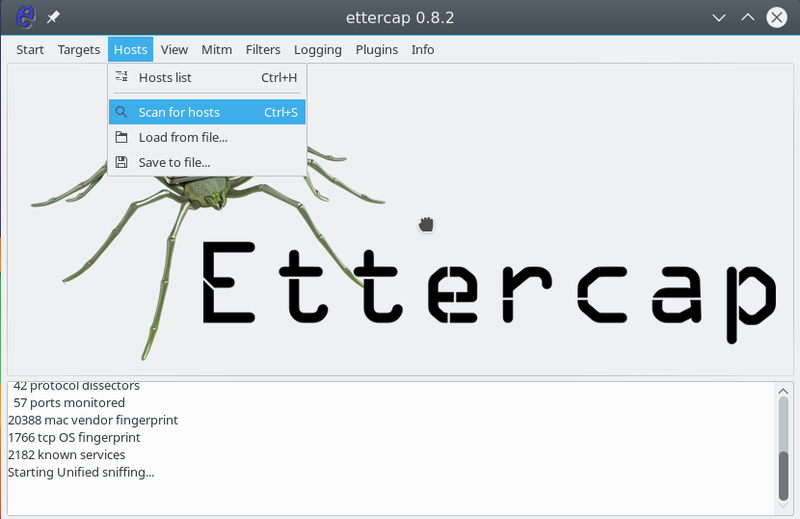 The program allows you to perform attacks like "Man in the middle" to force another computer to transfer packets not to the router, but to you. 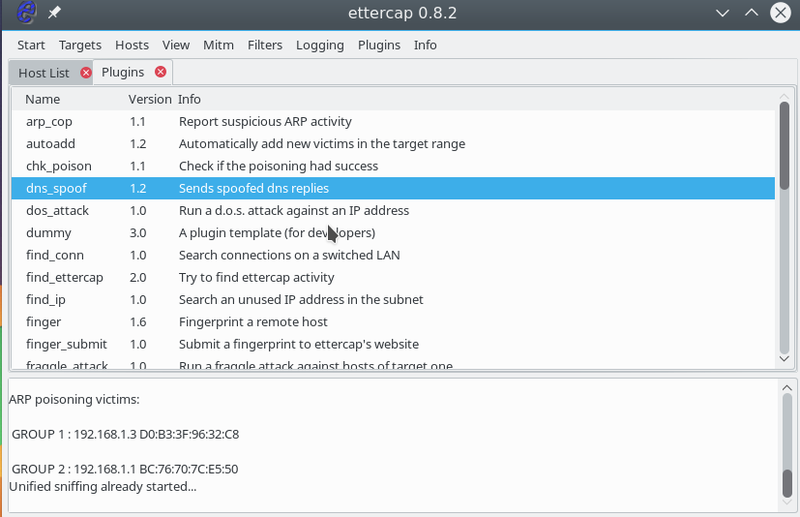 With Ettercap, you can check the security of your network, how susceptible it is to this type of attack, and also analyze traffic from several computers, and even modify it on the fly. 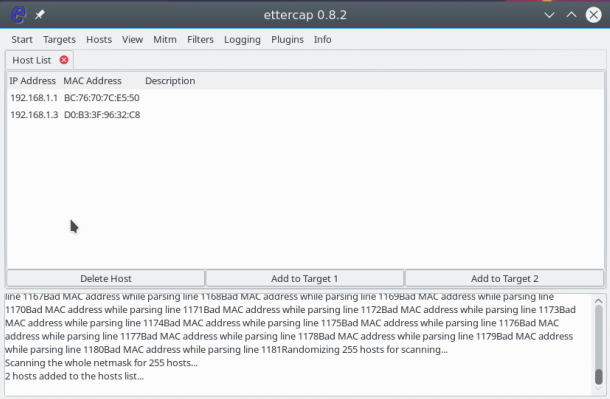 In this article we will look at how to use Ettercap to analyze and modify traffic. What is man in the middle attack ? By default, the computer sends all network packets that need to be sent to the Internet and sends it to the router, which in turn sends them to the next router until the packet reaches the target. But for certain reasons, the packet can be transmitted not to the router, but immediately to your computer, and only then to the router. 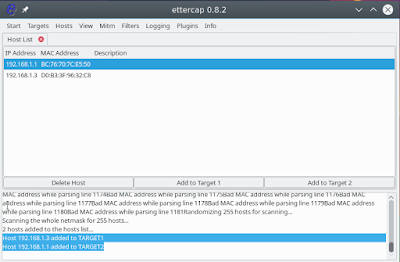 The computer through which the packets will pass can analyze the source, target address, and if they are not encrypted, then their full contents. DNS attack - when a computer tries to get an ip address for a domain, we substitute this address for its own, but for this type to work, you need to use the ARP method. Ettercap Linux can perform both types of attacks. 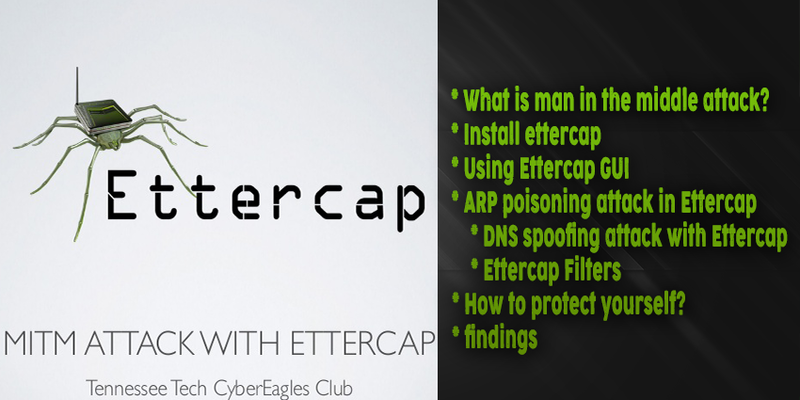 In addition, the utility can perform denial of service attacks and scan ports. 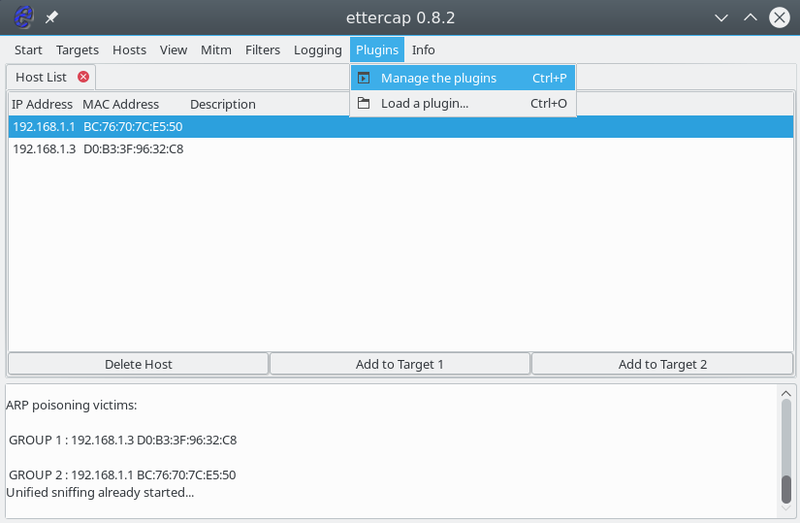 Now let's take a look at how to install and use Ettercap. 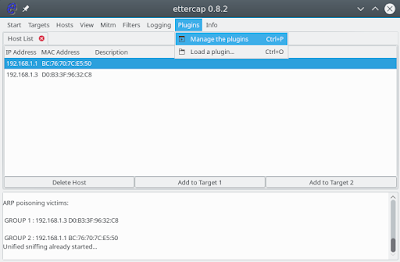 We coped with the task of installing Ettercap Linux, but before using it, you need to change a few settings in the configuration file. 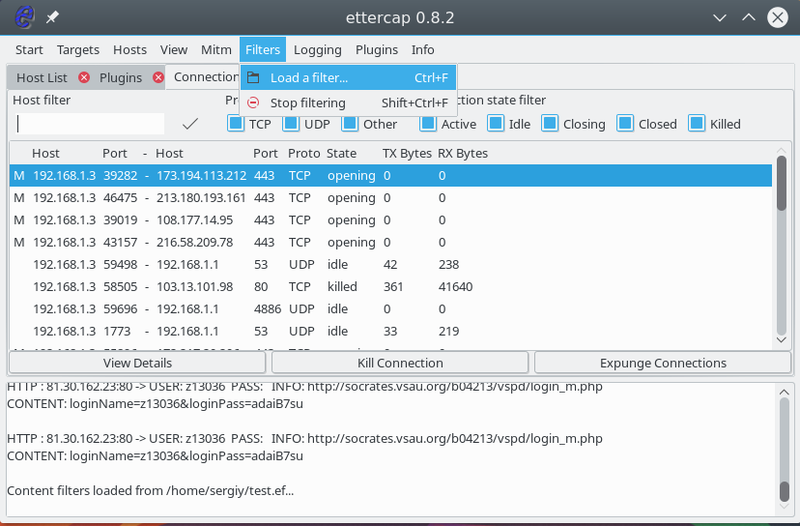 They are used to redirect SSL connections to regular HTTP, if possible. 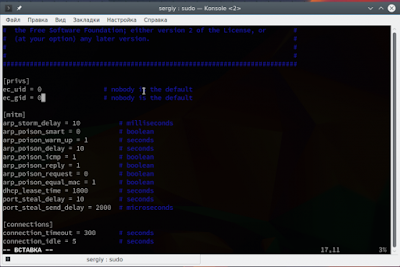 Then save the changes and the program is ready to work. 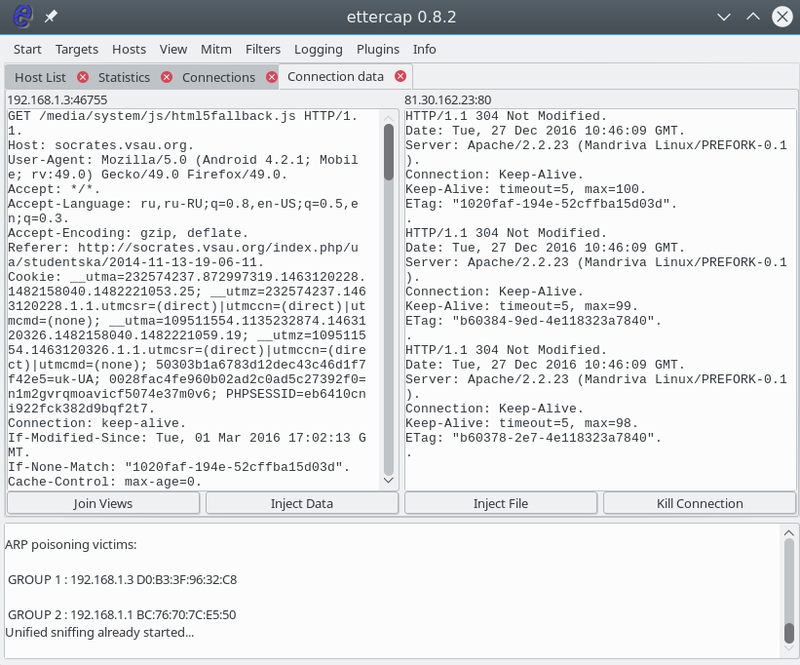 We use the -E option for sudo to save all of our user's environment variables. 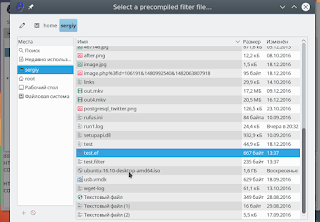 The main window of the program looks very simple. 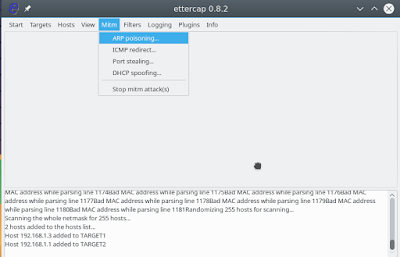 First we look at how the ARP-poisoing attack is performed. 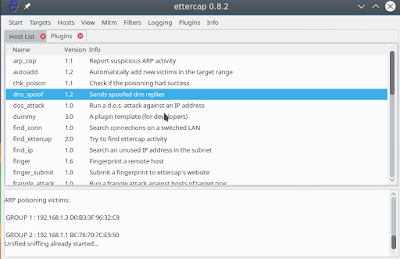 As I said, with this attack we can force the target computer to send packets not to the router, but to us. Everything works quite simply. The computer knows the IP of the router, it got it when connected to the network. 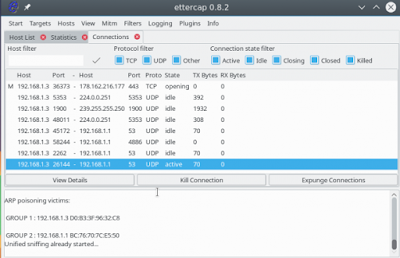 But every time he needs to send a packet, he needs to convert this universal IP address to a low-level address of the network technology used, for example, for the wired Internet - this is the MAC address. For this, the ARP protocol is used. 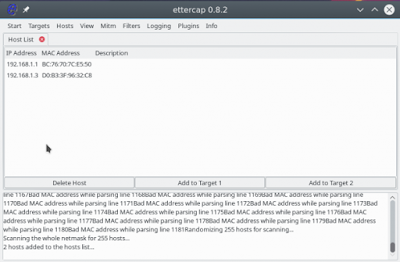 The computer sends a request to all devices on the network, for example, "who is 192.168.1.1" and the router, upon seeing its address, will send in response its MAC. 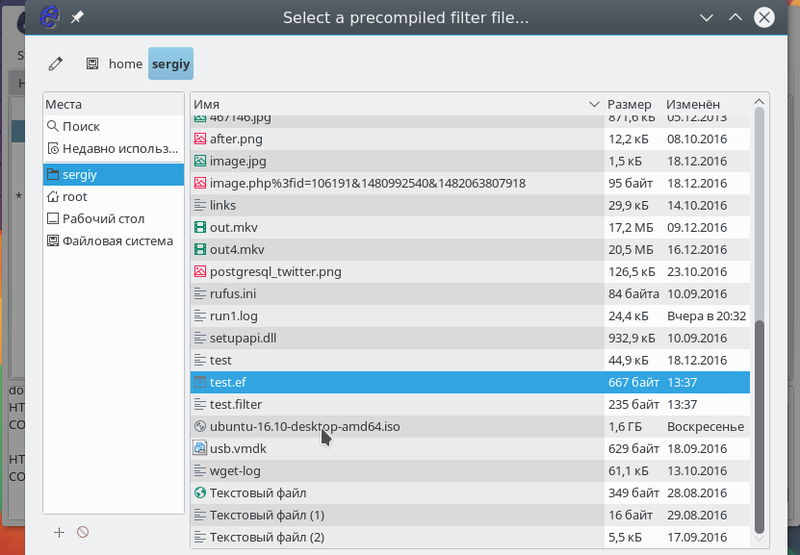 Then it will be saved in the cache. 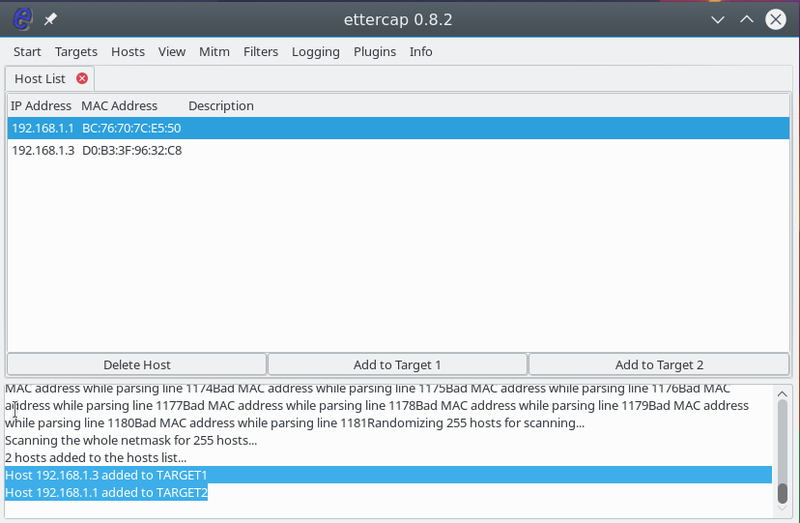 But we can use Ettercap to ask the target computer to update its ARP cache and transfer its MAC address instead of the MAC address of the router. Then all the packages will be transferred to us, and we will send them where necessary. 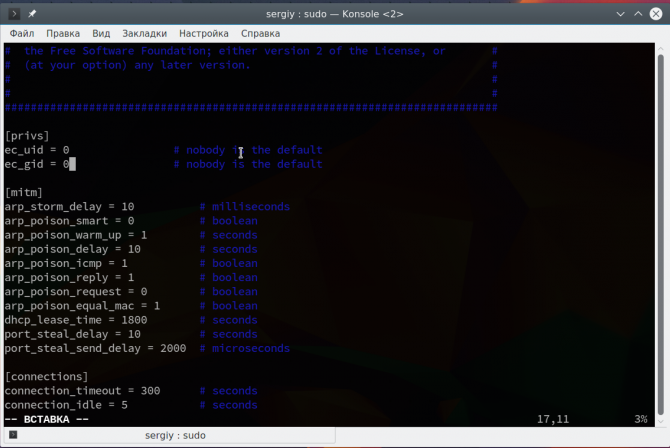 Now, to start the substitution process, in the Start menu, select Start Sniffing. If the packet was not encrypted, then we can view the transmitted information by clicking on the connection with the mouse. 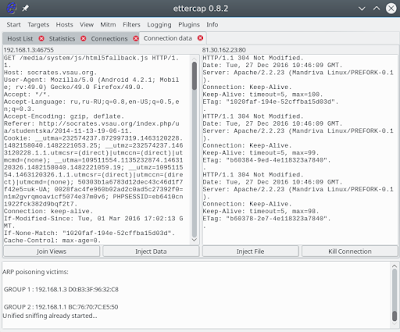 The sent information is displayed on the left, and the received information is displayed on the right. In addition to these plug-ins, there are others with which you can perform the necessary actions. 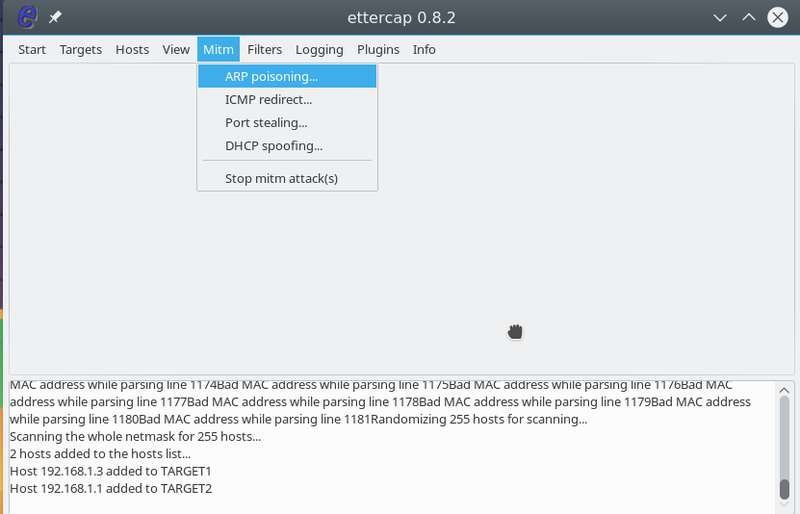 ArpON is a small service that monitors the ARP table and protects it from spoofing MAC addresses. 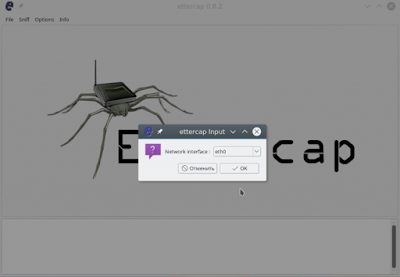 In this article, we looked at how to use Ettercap, a program for analyzing network packets and performing Man-in-the-Middle attacks. 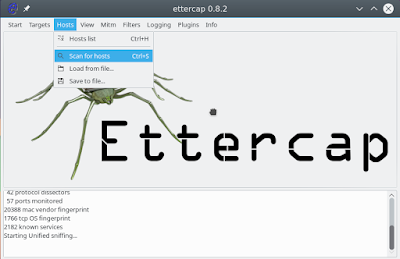 Use the program only to test the security of your networks or applications, and do not forget that illegal actions in the information space are also punishable.